With more than 95,000 specimens, the Division of Amphibians & Reptiles has steadily grown to become one of the largest herpetological collections in the western US. Personnel and associates conduct research in the American Southwest and throughout Latin America. The division is the primary repository of specimens for the New Mexico Dept. of Game and Fish. Division of Arthropods maintains collections of specimens gathered worldwide. These serve as the basis for discovery of new species and systematic studies of amazing diversity. More than 350 families and 2,300 species are represented in this rapidly growing arthropod collection. The Division of Birds contains more than 40,000 specimens, which represent all bird orders and 85 percent of bird families. The collection contains historic specimens of threatened, endangered, and extinct species such as the passenger pigeon. The largest holdings are from the American Southwest, Peru, and South America. The Division of Fishes has 95,000 cataloged lots of fishes - more than 4 million individual specimens. Collections of eggs, larvae, and adults aid in the study of the specialized ecology of desert fishes. The division is the primary repository for academic and agency biologists in New Mexico. The Division of Genomic Resources (DGR) maintains more than 460,000 archived tissue samples and nucleic acids from over 200,000 specimens of mammals, birds, reptiles, and fish. The DGR collection is global in scope, representing taxa from over 30 countries. Our mission is to maintain a permanent reference archive of frozen tissues and DNA to aid in understanding the complexity of biological diversity and to address critical biological problems such as emerging pathogens, habitat degradation, pollution, climate change, and invasive species. The herbarium houses 130,000 plant specimens dating back to the 1800s. The collection primarily contains vascular plants, but it also contains lichen, mosses, and fungi. The herbarium also has a library, reprint collection, and a laboratory for cytogenetics. With more than 300,000 specimens, this division is among the world's three largest mammal collections. Specimens represent more than 1,700 species from localities all over the world, with especially large holdings from Panama, Bolivia, Siberia, Mongolia, Alaska, Canada, and the American Southwest. The Division of Parasitology holds the third largest collection of parasites in North America. There are nearly 30,000 cataloged parasites, including a growing schistosome archive. This collection is unique in that most parasites are tied directly to the host specimen, allowing powerful integrated views of coevolution. Natural Heritage New Mexico (NHNM) does research on the conservation and sustainable management of New Mexico's biodiversity. We have New Mexico's only state-wide rare species and ecosystems database (NM Biotics) which helps shape conservation efforts. NHNM does biology research and education in the context of conservation and climate change. 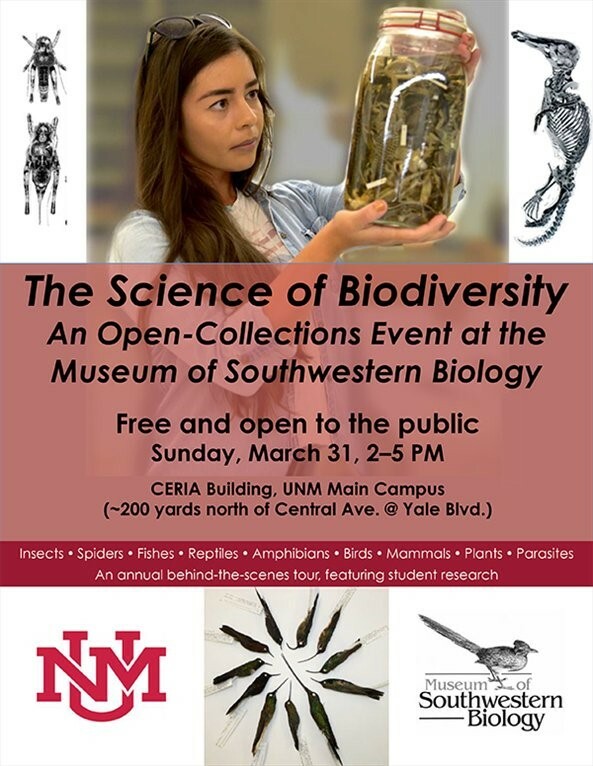 The Museum of Southwestern Biology is a research and teaching facility in the Department of Biology at the University of New Mexico. MSB will open its doors and collections to show off its expansive scientific collections of biodiversity specimens. First, on Thursday, 3/28, 4:30–6:30PM, MSB invites the UNM community to attend its annual Research Day Open House, held in conjunction with the UNM Department of Biology Research Days. Second, on Sunday, 3/31, 2:00–5:00PM, MSB will open to the general public for the first time in this special event: The Science of Biodiversity, an Open-Collections Event at the Museum of Southwestern Biology. This event will be free and open to anyone who is interested in learning more about the evolutionary origins, ecology, and conservation of the world’s biota. Student researchers, curatorial assistants, staff, and faculty curators will be on hand to exhibit a variety of specimens and explain the latest research findings to emerge from our collections.